This project dealt with management of feral hog populations at MINWR and NASA’s Kennedy Space Center (KSC) in Florida, USA. During the Project Dr. Rosenfeld worked closely with MINWR personnel and local hunters to capture, tag and re-capture feral hog on KSC grounds. More than 100 hogs were trapped. Using program MARK, the population size was estimated and population dynamics were analyzed. Using program RAMAS changes in population over time were estimated, proving the need for management. 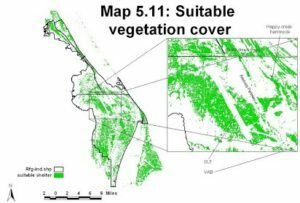 Feral hog habitat selection was analyzed using LIDAR data and LANDSAT derived vegetation maps in GIS. The factors that most influenced feral hogs habitat selection were forest density and the distance to citrus groves. height covers derived from a KSC LIDAR data set.